Amana has a solid reputation in the industry for reliability as well as good energy efficiency and the Amana GSH13 Distinctions heat pump is an excellent example. This model has been around for several years and has proven its worth and durability. Devon in Potlatch, Idaho wrote with his Amana GSH13 Distinctions heat pump price and an explanation of how he plans to use this unit. We always appreciate it when readers share their HVAC prices with us. Here’s what Devon had to say. “I heat my home with a radiant wood stove so I don’t need a gas furnace. But I do want central air conditioning for the hot days in the summer and having a back-up source of heat isn’t a bad idea either. That’s why I chose the Amana GSH13 Distinctions heat pump. Up here it doesn’t get too hot very often, so a high efficiency unit isn’t needed either. If you want to read into this that I’m a cheapskate, then you’ve got it about right! This unit is reliable and cheap, like my ’92 Chevy pickup and my dog. That’s a quality system at a good price for Devon in northern Idaho. Here are the details on the heat pump. 13 SEER cooling, 7.7 HSPF heating. Efficient 1/6 horsepower scroll compressor uses less electricity to run. Compressor is insulated for noise reduction. The coil features rifled copper tubing and aluminum fins for corrosion-resistance. Amana patented sound control top. Enclosed filter dryer improves performance. Galvanized steel cabinet with weather-resistant fasteners and rust-free pan. 10-year limited warranty when properly installed and registered within 60 days. The best way to assure quality performance and the longevity of your heat pump system is to hire a qualified contractor to install it. They will have the know-how and the tools that Devon realized he did not have for the job! 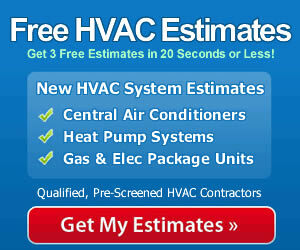 Their skill set is unique to HVAC installation and even experienced DIY carpenters and handymen generally don’t have the qualifications to tackle this work. With a qualified expert you’ll get the peak efficiency, energy savings and durability out of your unit, and that’s music to every cheapskate’s ears!